Over the past several decades, "mom and pops" have fallen by the wayside, fated to the same grisly ending that Barnacle Bill warned The Fair Young Maiden about. 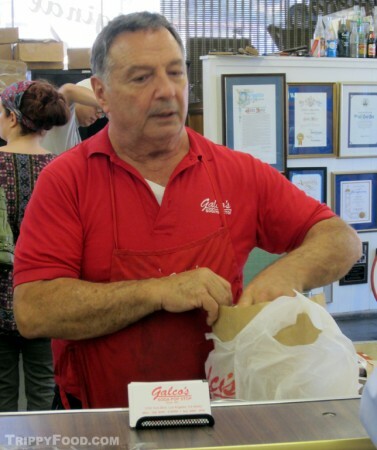 When faced with impending doom approximately 15 years ago, John Nese of Galco's Old World Grocery in Highland Park did what any other legacy neighborhood grocer would do - he threw all caution to the wind and decided to go out in a blaze of glory. Galco's was originally established in 1897 by partners Galiota and Cortapassi on Castellar Street (now known as Hill Street) in Chinatown (which, at the time was Little Italy). To make way for construction, Nese's parents (who became partners in the grocery in 1940) purchased a building that housed an A&P grocery (and formerly White's Grocery) on York Boulevard back in 1955 and moved the business there, where it has been ever since. In the 1990s, the grocery was being squeezed out by the big chain supermarkets and even the City of Los Angeles and State of California was making it difficult for Galco's and other mom and pop grocers to compete; when their beverage distributor (Pepsi) found out that Nese was directing his customers to the chains where they could get soda cheaper, they issued an ultimatum - buy from them or say good bye. I asked Nese what prompted him to start stocking independent and hard to find sodas, beer and wine, he simply said, "That's easy - I figured if I'm going to go broke, I might as well go happy". 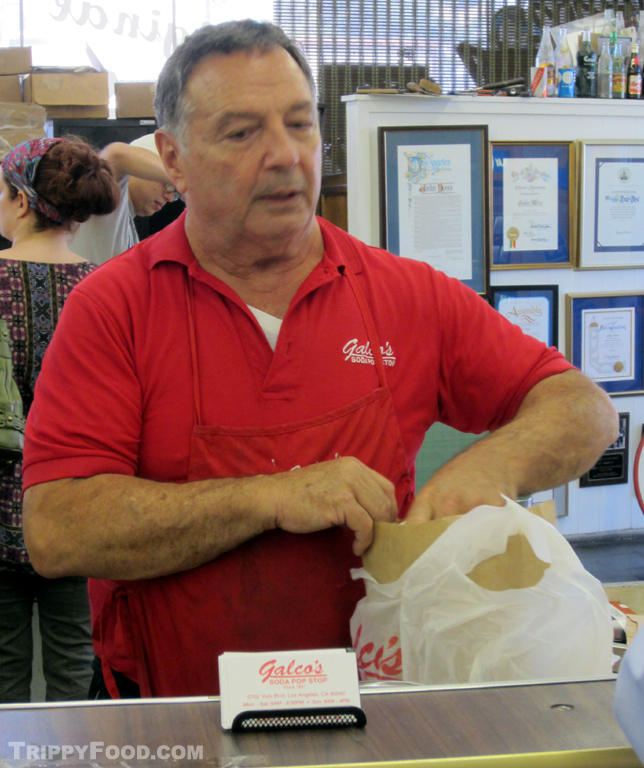 This simple strategy was the turning point for Nese; Galco's became a local landmark and site of cultural and historic significance and has been visited by local and national media. 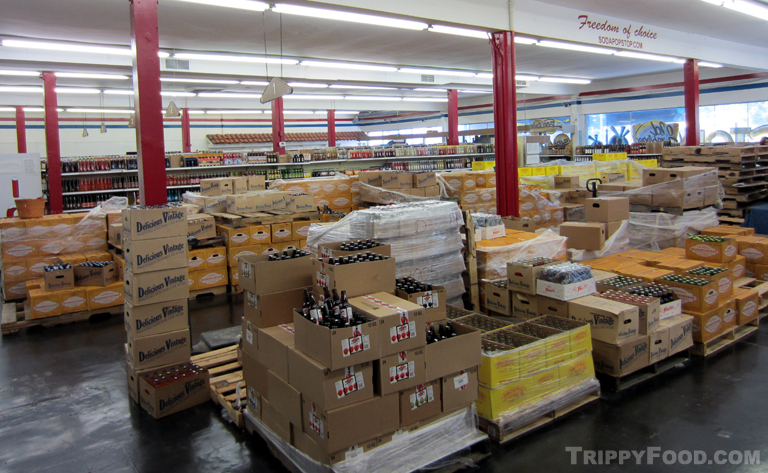 The store has expanded into the adjoining space and the open area just past the registers at the front is stocked with pallets of cartons filled with cases and cases of rare, unusual and hard-to-get sodas, beers and wine. 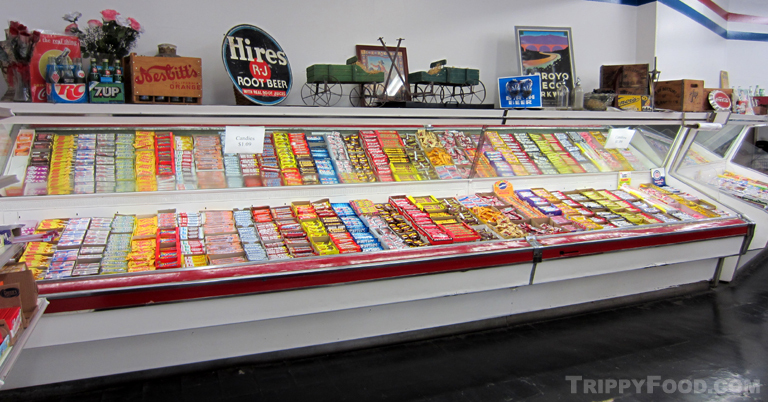 Several former produce cases on the side wall now hold a wide variety of candy: local favorite Abba-Zabba is represented, but I was also pleased to find candy from my youth in the Boston area including Charleston Chew, Squirrel Nut Zippers and Necco Wafers. What surprised me the most was their selection of Bonomo Turkish Taffy, which I haven't seen in years (Nese informed me that they only started making it again recently). Against the window, a row of shelves that seems to stretch on like I-10 in Arizona holds a plethora of wine and wine-like beverages, including Mad Dog 20/20 in every color of the rainbow. At the end of the row are unique beers, including the appropriately named Delirium Tremens from Belgium and the deli counter where Galco's still makes sandwiches. One section of the sandwich menu contains over-stuffed Blockbusters, sandwiches inadvertently named by fighter Rocky Marciano. According to Nese, Marciano came in shortly after they began serving sandwiches in the 1950s and when he brought the behemoth to his face, he said, "This is a real blockbuster". The deli counter is a shadow of its former self; one of the meat cases contains single soda bottles on fake grass, with the others holding the freshly made potato salad and deli meats from Molinari in San Francisco. Bread for the sandwiches comes in fresh daily from local Frisco Bakery as it has since 1940; the sandwiches are done in traditional style without the extra stuffing of lettuce and tomatoes. I had the Original, laden with Italian cold cuts and as tasty as you would want a sub sandwich to be. Behind the deli counter the old maple butcher block and meat trolley system sit unused; Nese confesses that he did much of the butchering back when Galco's was a full service grocery, and although he hasn't done it in years, he could probably break down a side of beef like a pro. The row of shelves in front of the deli is packed with an enormous variety of beer from around the world, so you probably ought to be shopping elsewhere for your case of Bud Light. 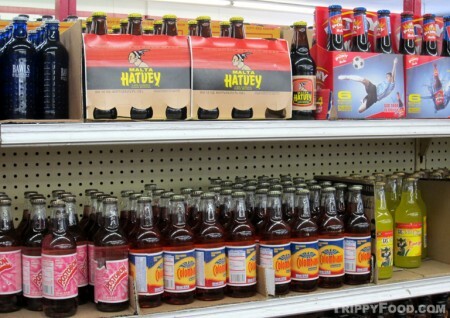 Zigzagging your way back to the front of the store you will encounter aisle after aisle of sparking and mineral waters, and well as sodas, including a selection of Colombian soda including Colombiana, Pony Malta and Postobón. This entry was posted in Trippy Food (Tasty flora and fauna), USA and tagged CA, California, candy, deli, Friends of the Southwest Museum, Frisco Bakery, Galco’s, Galco’s Soda Pop Stop, grocer, grocery, Highland Park, John Nese, L.A., LA, Los Angeles, Mad Dog 20/20, Molinari, mom and pops, Rocky Marciano, San Francisco, sandwiches, soda, soda pop, subs, York Boulevard. Bookmark the permalink. Never have been much of a soda drinker, but I am certainly enchanted by the colors and styles of packaging. Great shot of the candy aisle too. The Sub don’t look so bad either. Thanks for the share! Some of the sodas had a nice taste – others were sugary and weren’t too memorable. I would recommend the Moxie if you haven’t tried it, and the Empire Bottling works’ spruce beer – it’s like drinking a Christmas Tree (and I mean that in a good way).